Building a Spiderbeam is really QUITE EASY, but there is a lot of repetitive work. As a result, it usually takes you about 20 to 25 hours to build the beam if you work slowly and double-check your work as you go. The Portable version takes a couple of hours more because you have to glue the Velcro strips onto the fiberglass spreaders and wait for them to dry. Proper adjustment of the center-hub to the mast. Page 18, paragraph 3.1.1 : Mounting the Vertical Mast. This step is the one that users get wrong the most often! This files shows you THE MOST IMPORTANT step in assembling and erecting a Spiderbeam. Note: Wire elements should not be measured when the elements are mounted on the fiberglass spreaders. Lay the element to be measured on the ground in a straight line, and then use a long tape measure to measure the lengths. Measuring with a short "yard-stick" or "ruler" will result in inacurate measurements. It is best to do this with 2 people. This file contains step-by-step instructions (with pictures) for constructing the driven elements of the Spiderbeam. These are step-by-step instructions including pictures, for building the parasitic elements. This file gives you step-by-step instructions for building the special Spiderbeam Balun. This file contains step-by-step instructions for constructing the special Spiderbeam balun. This is the German version of this file. 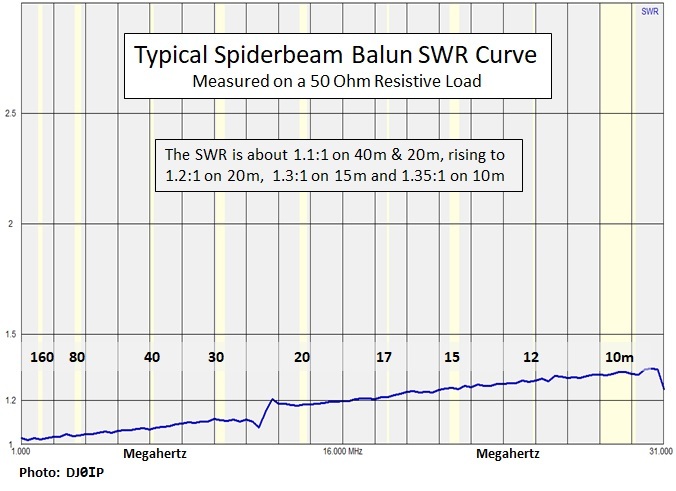 This chart shows the SWR curve of a typical Spiderbeam Balun across the HF Spectrum. The instruction manual is a bit confusing on this. It shows you how to mount the elements to the Portable Yagi using Velcro, but how to mount the elements to the HD Yagi is much farther in the back of the manual. This document is an excerpt from the book, showing details for the 5 Band HD Yagi. This documents give additional information for mounting the fiberglass spreaders onto the pole and mounting the wire elements onto the spreaders. It may also be used as a guide for the 3-Band Yagi; the procedure is the same. This document show how to install the spreaders and why we do it that way. This drawing shows exactly where to place the Rubber Rings. This Tip shows exactly where the Guy Ropes attach. This is additional information showing where the balun is located. This drawing shows exact element placement onto the fiberglass spreaders, assuming the use of a 45mm Standpipe. If you use your own center mast with a diameter of 40 to 50mm, you may use these instructions. If you use the 35mm Standpipe, the first element will be 1 cm closer to the center of the mast. This is additional information showing how the driven element is mounted to the fiberglass spreaders. Although very simple, this is often misunderstood. This drawing helps to understand exactly how to mount the 15m driven Element. These two drawings help explain how to position the first driven element when using the 45mm or the 35mm Spiderbeam Standpipe for the center mast. This is additional information showing how to string the PVDF horizontal guy lines. This is additional information showing how to prepare the ends of Kevlar Rope before using it. This describes a common mistake many people make when attaching the Driven Element feedlines to the balun. This explains the mod in the file above.